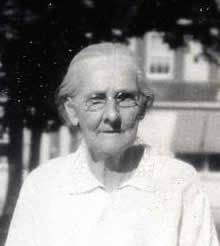 My first TBT is devoted to my 2nd great grandmother, Elizabeth E. Ferry. I never met the woman (neither did my mom). Elizabeth died at 73 years old. She died at home, an old house whose foundations now lie beneath a bank parking lot in Fawn Grove, Pennsylvania. It was a Tuesday in April 1937 and she’d been suffering from bronchitis and pneumonia since February. Her husband, George W. Channell, died 8 days later. Elizabeth was attended to by the local doctor, Dr. Vallie Hawkins, who had also helped deliver most of her children years before. None of this is particularly interesting, until you consider that Elizabeth, a short bespectacled woman of small frame was mother to at least 12 children, 10 of which survived to adulthood. The couple named their youngest child, Vallie (born when Elizabeth was 42), after Dr. Hawkins. My grandfather and grandaunt had fond memories of spending summers in Fawn Grove with their grandparents and many, many cousins, but details from Elizabeth’s life are sparse. Her father’s name was John, but on her death certificate no one could remember her mom’s name or where in Maryland she was born. A local newspaper snippet from the 1920s stated that she was leaving town to visit sisters in Texas, Maryland but gave no names or address. In 1931, her family held a Golden Wedding Anniversary at Spring Valley Park. Over 30 people showed despite it being a rainy Sunday in September. Basket lunches were served in a large hall decorated for the occasion. In 1914, they took “an automobile trip” to see their son Howard, who ran a saloon in Harrisburg. They also traveled to Baltimore now and again to visit my great grandfather and his family. I’ve been doing genealogy since I was teenager and am always thrilled to find bits and pieces of people’s lives beyond the names and dates. We’ll never be able to travel back in time to visit them, but each piece of information creates a small window that lets us know them a little better. Perhaps the most endearing piece of trivia I’ve found on Elizabeth appeared in a local paper from 1914. It reads, “Mrs. George W. Channell gathered her first ripe tomatoes on Monday. These are the earliest ones in this neighborhood this season.” My great great grandmother died 31 years before I was born, but I know she was a good mother, a tough woman, and a good gardener. I think that’s awesome.